Baster, Slabber and Bomme lived in Zeeland, in the South of the Netherlands. Baster ann Slabber collected their specimens in the Scheldt estuary while Bomme latter studied material washed on the beach. Using a map of 1773 their sampling sites are discussed below. Baster collected his species on different places around his hometown Zierikzee which is located on the island Schouwen-Duiveland. 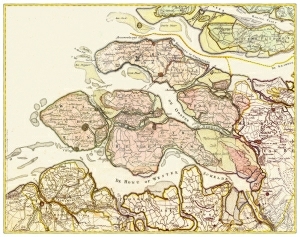 The Oosterschelde lays close to Zierikzee, to the South. To the North of the island lays the Grevelingen. 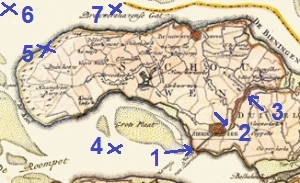 Baster sought (1) on stones and poles of the dykes, on oysters and between seaweed at Zierikzeese Hoofd, (2) on silt in the Dijkswater near Zierikzee and (3) at the verste Sas and (5) on the beach. Also he tells that specimens were brought to him by locals or fishermen who collected them (4) on the Oosterschelde or (6) on the North Sea. Species of brackish waters where found (near 2) in Kaasjeswater and ditches and lowland around Zierikzee. Brouwershavense en Goereese gat (7) where the places to look for large sea anemone species. We know Slabber caught most of his specimens with a dip net. But the exact place were he collected them, has been a question to many authors. 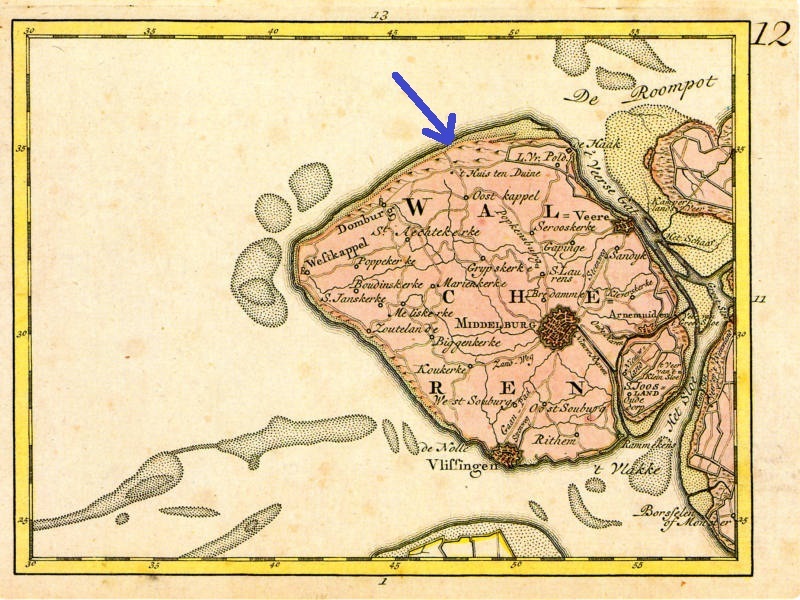 Maitland (1851) mentioned 'seawater near Middelburg', later authors where more cautious locating his finds 'at the coast of Walcheren'. As can be seen on the map of 1773 Middelburg lays on (the former island) Walcheren and is connected to the Westerschelde by a canal. Ships of the West- and East Indies Company used this canal to habour in the town. At the time he collected his species, from 15 june to 6 august 1768, Slabber lived in Middelburg (vBJ 1970). In this short period he sampled species on 22 different days, so we may assume he didn't go too far from his home. The conclusion must be that he collected his species in Middelburg. According to Slabber, who visited the place, Burgvliet laid 15 minute walk from the beach. (Slabber 1778, p. 92) At this North Sea beach Bomme collected material washed ashore. At home in Burgvliet he studied the organisms in glass bottles and under his microscope. On some occasions he got his material from a fisherman who just happened to drag his net to the beach.